I used to read a lot of comic books when I was a kid... and while Marvel books may have been cooler, I was more drawn to the characters of DC... my favorite being Green Lantern. As I hit my twenties, it was the period when DC running sensational stories.... Superman killed, Batman's back broken, and Green Lantern turned evil. There was plenty of other stuff going on in my life, so I more or less drifted away. A few years back, I had to squeeze my life into the back of a pickup to move a few states a way, so I had to jettison most of my comic books. Goodbye Batman, farewell Spidey, happy trails Groo. But I made room for the Green Lanterns and Justice Leagues. These were my favorites. And so on the precipice of the new movie, which could make him a star or could make him a joke, I decided to write up a history in tribute to my favorite childhood heroes. The original Green Lantern was a railway worker who came across a magic lantern, which he took a piece of and forged into a magic ring. The ring could be used to do just about anything he willed it to, except that it was useless against wood. Green Lantern was popular in the 40's, but the superhero thing died out at the end of the decade, and Green Lantern stories ceased to be printed in 1951. When Green Lantern stories returned, Alan was replaced with a new Green Lantern. But Alan Scott was later reintroduced as the Green Lantern of "Earth-2", and the two would frequently team up. 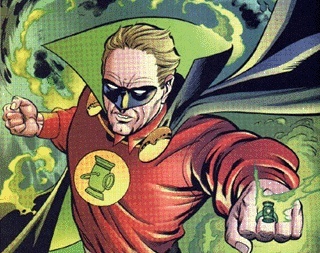 In the 1980's, Alan was rewritten into the main Earth, and the lantern his ring was forged from was now stated to have been made of the same stuff that other Green Lantern rings are made from. So Alan has never really been one of "The" Green Lanterns, but he's treated as a friend and mentor by all of the other Green Lanterns who have come and gone on Earth. A few years later, superheroes made a comeback, but this time they had more of a sci-fi bent to them. 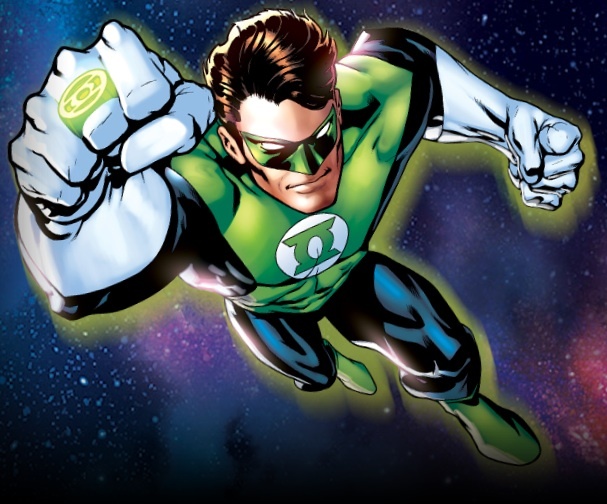 Green Lantern was reinvented... this time the hero was a test pilot who encountered an alien that gave him a ring that allowed him to bend the power to his will. 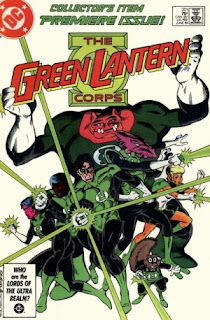 From time-to-time, though, mysterious people would contact him through his ring.... these people were later revealed to be the Guardians of the Universe, and Hal discovered that he was not alone... that he was actually just one member of an intergalactic police force called the Green Lantern Corps, comprised of thousands. 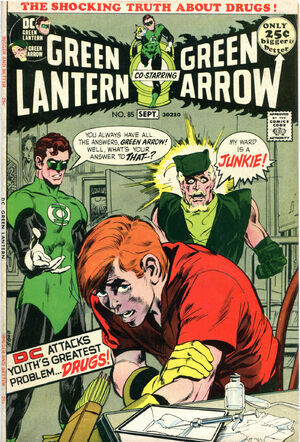 1970s- Green Lantern and Green Arrow: "Hard-Travelling Heroes"
In years previous it had been established that Hal had a back-up named Guy Gardner (more on him later) who would fill in for Hal if worse came to worse. And for story purposes, they threw Guy under the bus so that they could do a story about Hal training a new backup, this one a black man... and use the situation to explore racial issues. Stewart became a regular part of the supporting cast when the book was relaunched in 1976, and even filled in for Jordan in the Justice League. In 1984, as part of the ongoing storyline at the time, Hal Jordan quit the Corps and John Stewart was officially named Green Lantern of Earth. With sales lagging of Green Lantern lagging, with issue #200 they decided to change up the game... the Guardians took off and left the Corps to their own devices. Hal Jordan and John Stewart would return to Earth with a couple of female Green Lanterns that they picked up, and few other alien green lanterns, disenfrachised from their home planets, were invited to come to Earth as well. Sales continued to lag, and Green Lantern was cancelled once again in 1988. 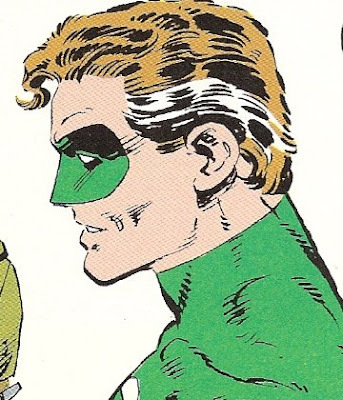 Guy was originally introduced in a what-if story of sorts in the 1960's, where it was revealed that both he and Hal were deemed equally qualified... Hal just happened to be closer. Though he was replaced by John Stewart, Gardner did eventually get to work with the Lanterns, only to have it explode in his face (no, literally, a lantern exploded in his face)... he disappeared and was presumed dead. On his return, a series of events left him pissed off and a little deranged. He was more of an antagonist for the other Green Lanterns and found himself unwelcome in the Green Lantern Corps that had formed on Earth... but he did find another place where he fit right in.. In 1987, DC decided to do something different with the Justice League. Long story short, a completely dysfunctional group was put together and milked for all the humor they could get out of it. 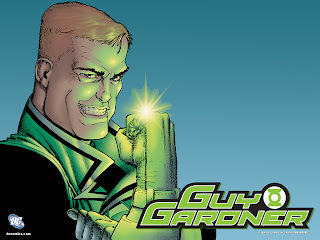 And the most dysfunctional character of all was Guy Gardner. Guy was such a popular character that they eventually decided to spin him off into his own book. But for some reason, the decided to coincide that with him losing his ring when Hal Jordan decided Earth wasn't big enough for both of them. Not content to return to normal life, Guy got ahold of the yellow ring that once belonged to Sinestro. The problem with Guy is that later writers didn't have the touch that the original Justice League International writers had of balancing comedy with reality. He was later reinvented as Guy Gardner: Warrior, wherein he was revealed to be an alien himself, and his own body a living weapon. His own book failed, Justice League had moved back into more serious territory, and Guy went into semi-retirement, opening a bar called Warriors that was a tribute to Green Lanterns past. You may have heard that Superman died and got better. In the process, however, a bunch of guys calling themselves Superman were running around, and the really evil one destroyed Hal Jordan's home of Coast City. He took his grieving in an unhealthy direction, using his ring to try to recreate Coast City. The Guardians didn't approve, and tried to cut off his power. So Hal Jordan murdered the entire Corps and broke the battery, and became the villain known as Parallax. Parallax was pretty much the baddest guy of the DC Universe for awhile, and was the Central Villain in the mega-crossover "Zero Hour", which was another of his schemes to rewrite history. Then in 1996, an event occurred called the Final Night, wherein the sun was extinguished and the Earth was doomed. Using all the power he had accumulated, Hal sacrificed his life to reignite the sun, dying a hero once again. And then it occurred to someone that there was another superhero named the Spectre, who happened to be a ghost, and happened to wear a lot of green, and what a great idea it would be to pass the mantle of the Spectre on to Hal Jordan. So at any rate, what was the point of turning Hal Jordan and destroying the Corps in the first place? So the plan was to reinvent the wheel... the powers that be must have decided that an entire Corps of Green Lanterns was too much baggage, and wanted to start fresh... one Green Lantern and one alone (if I recall correctly, this was the period of time where Alan Scott was reinvented and for a time, no longer needed a ring). The problem was, I always thought the Green Lantern Corps was what made this hero unique. Kyle killed my comic book habit. But in fairness, when I revisited this book over the years, it was pretty good stuff. At one point, Kyle himself ended up with a ring that could copy itself and tried to singlehandedly rebuild the Corps, but abandoned the project when one of his recruits was killed. John Stewart bounced around a bit in these years, initially becoming part of a new peacekeeping force called the Darkstars after his ring was depowered as a result of the Emerald Twilight event, beforing retiring back to civilian life and popping up frequently as a mentor to Kyle. It's like this... it turns out that Parallax was an evil entity that had possessed Hal... Parallax was the one that did all the killing, and even caused Hal's hair to turn grey prematurely. Hal Jordan was resurrected and once again became Green Lantern of Earth. The Guardians returned to rebuild the Corps and declared that each sector would now have two Green Lantern, and John Stewart was made the second, continuing to serve with the Justice League to mirror the ongoing Justice League cartoon series. 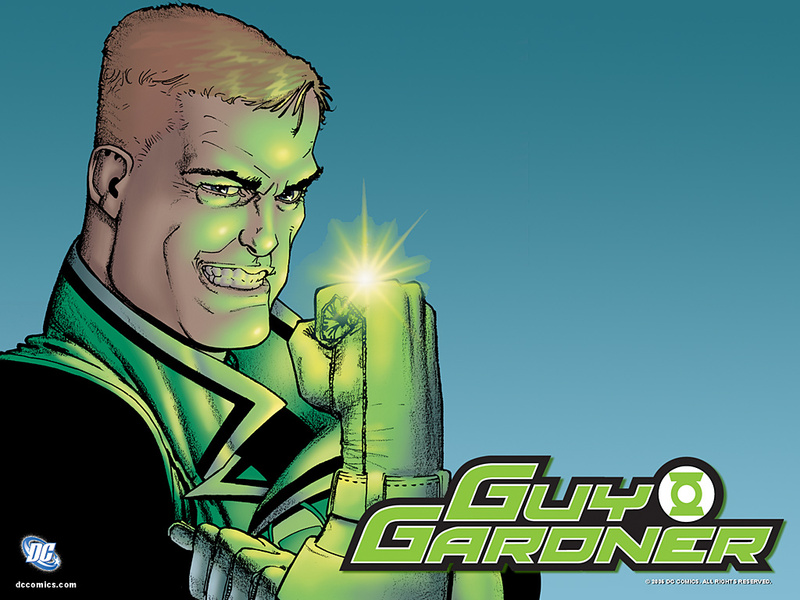 Short of veterans, Guy Gardner stepped into the role of senior officer and trainer. 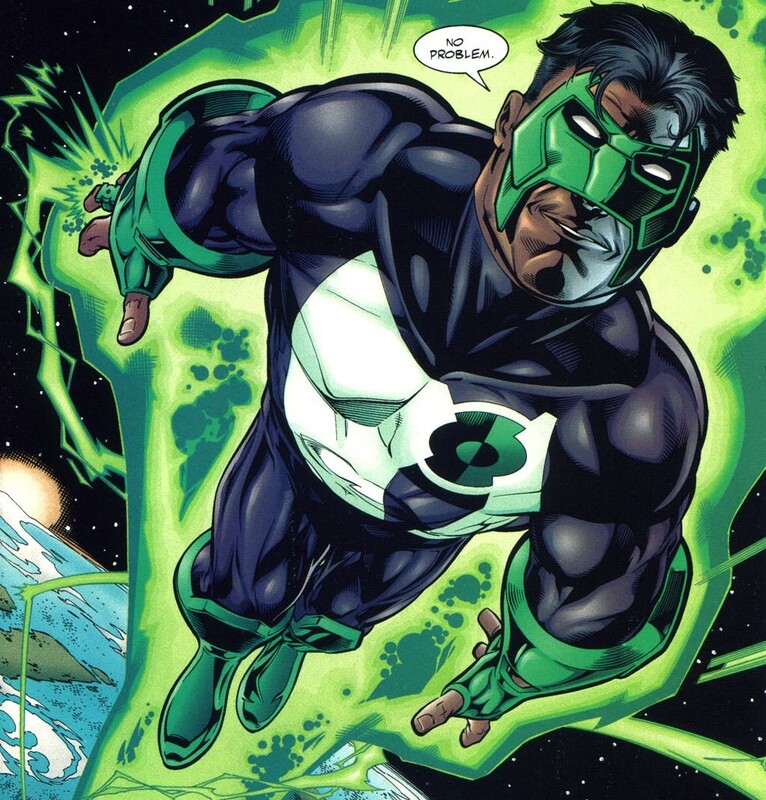 Kyle is given the honor of being named "the torch bearer" for keeping the Green Lanterns alive, and operates primarily in space. So Hal would be featured in the main Green Lantern series, John in Justice League, and Kyle and Guy would lead the new members in a second ongoing GL series called Green Lantern Corps. So we had the heroes with their green rings, and a set of villains with yellow rings. Early on in the reboot, the stage was set of linking colors to other emotions, building to a whole pantheon of colored ring-bearers. As things were coming to a head in this War of Rings, a new threat occurred that forced the colors to unite against the Black Lanterns and the prophesied "Blackest Night". The Crisis has been averted, and a rainbow of rings still exists. DC will be relaunching its entire universe in September, and Green Lanterns will be all over the place. 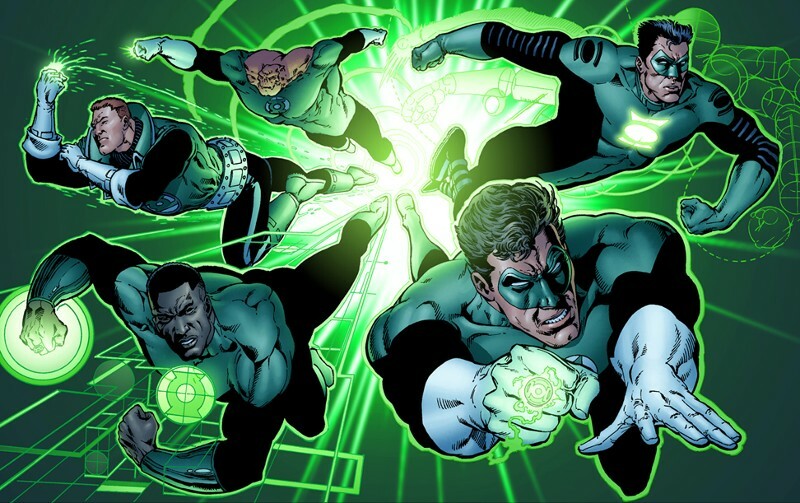 Aside from featuring in the primary Green Lantern comic book, Hal Jordan will also be appearing in the Justice League. The Justice League International is returning with Guy Gardner in the pack once again. Guy will also be featured along with John Stewart in the relaunch of the Green Lantern Corps. Kyle Rayner will be part of a group of multi-colored warriors called The New Guardians. And a Red Lanterns book is scheduled as well, I've heard no details yet on the latter book. Four books and two team appearances? I don't think even Superman-related characters will have that many books once we get all the announcements, which would make the Green Lantern comic franchise second only to Batman in the DC Universe. Green Lantern's never been bigger than it is now, and now there's a movie to back it up. And easy access to downloading the books makes it the perfect time for me to jump back on board as opposed to just reading compilations at the Barnes and Noble. More to come. Good stuff - really looking forward to this movie - thanks for the look back. This is one of the best reads I have had the pleasure of reading in a while. Very good history, you know your stuff. Very thorough, I have to show this to the guys in the office. Followed! very thorough. Hopefully the movie is good, but I doubt it will be. 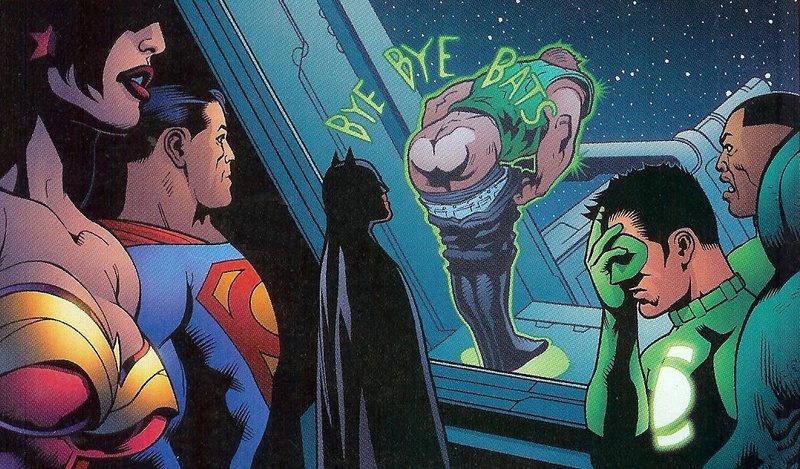 In the end Green Lantern still Batman's friend? wow this is a detailed history. I never knew John Stewart was a green lantern before he got his TV show. Shortly after Rebirth there was a Batman/Hal Jordan team-up where they reconciled. What I don't like is that I could take out both of the Green Lantern's with a #2 pencil. This makes me want to get back into super heroes and comics again. I never understood the love for him, but after reading that, i had no idea that Green Lantern had been around since the 40's. Was a very good read and retrospect on the mythos behind the character and idea. Thanks for that, maybe when i see the movie now, i'll have a better understanding of what's going on and might even enjoy it. Again, thanks for this.